Paul created a cool demo to explore some of the new features in TinyTLF V2.0 (still in beta). The circular region demo (yes, we can do the equivalent of CSS Regions right now in Flash) has been expanded. Check out the blog post here and enjoy! Update: For those who have asked, a new version of the demo with text constrained by spline boundaries is in the works, but scheduled for after the V2 formal release. I’ve given several Freehand drawing demos on my iPad-2 here at MAX, but one of the things I’ve failed to mention is the impending release of TinyTLF V2.0. You can read about the new features and implementation details here. 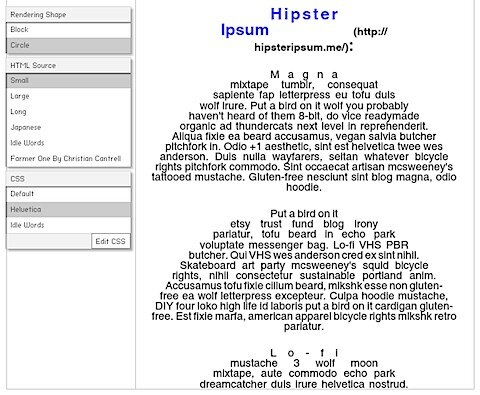 Paul and I recently collaborated on another organic text layout demo. I really like it when Paul does all the hard work and I come in at the tail end and wrangle some equations (a bit of analytic geometry). Where do I get more gigs like that? My time on this gig is almost over and I’ve really enjoyed working with this client. It’s also been great to work with a top-flight Flex architect. 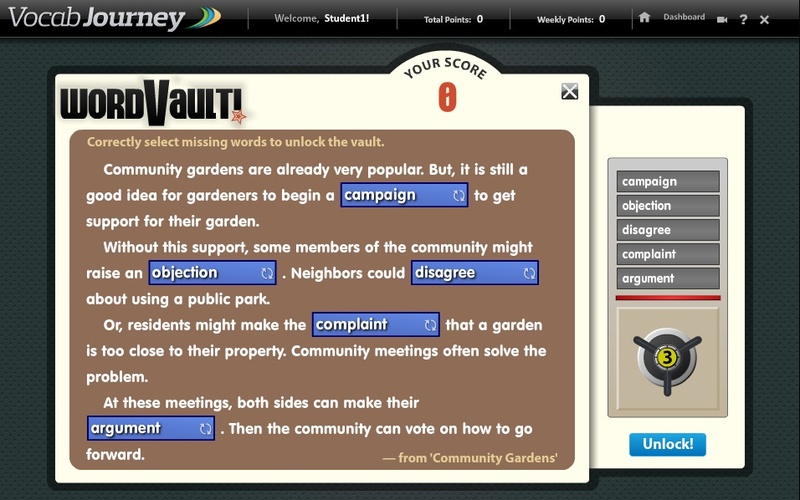 My responsibilities included overhaul of a massive legacy Flex 3 application using PureMVC and a new Flex 4 learning game. I’ve mentioned the use of TinyTLF in a prior post, so here is a screen shot of the completed product. The entire game is implemented as a Flex 4 Skinnable component, with separate skinnable components for the primary game constituents, the most complex of which are the passage display and the vault graphic controller. The former uses TinyTLF for the inline word selector rendering. 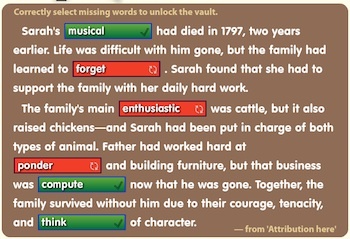 Word Selectors are injected based on block controller factory classes assigned in the CSS file for this game. The (artist-generated) vault graphic is embedded as a .SWF (not as symbols within a .SWF). The individual symbols are extracted and manipulated either as skin states or as part of invalidating the component. Different skin classes were substituted for the passage display during the course of development, ranging from customized formatting for different paragraphs to 3D boxes for the selectors. The ease at which these changes were made really emphasizes the benefits of Skinnable Components in Flex 4. I’ve been extremely busy with a gig the last couple months, so posts have been sparse. This is a quick preview of some work with Paul Taylor’s TinyTLF – http://www.tinytlf.org. Paul and I have collaborated in the past on spline-constained text layout and dynamic scrolling with quad. Bezier splines. While I’ve been keeping up with progress on with TinyTLF, this is my first serious application of the library. Some passages may contain <b> or <i> tags as well. Everywhere a <word> tag is present, an interactive word selector must be rendered in-line with the text. TinyTLF is used to render the text and the word selectors are rendered by a custom TextBlock factory assigned to the TinyTLF text engine. The factory and the word selectors implement specified interfaces (IWordSelectorBlockFactory and IWordSelector). An event is dispatched when the word selectors are added to the stage, which allows the skinnable component controlling passage display to obtain references to the created IWordSelector. TinyTLF allows the text to be easily styled by assigning styles, either through an external style sheet or constructed from Flex style properties assigned to the passage display class (the technique I use in this app). The rendered result is shown below after some interaction with the word selectors (the same synthetic data is used across all test passages, so the concept of correct vs. incorrect selection is meaningless in this example). The really cool thing about programming the skinnable component to a set of interfaces and not specific implementations is the ability to quickly create new block factories and selector implementations. This was actually used to switch out rectangular 2D selectors with Actionscript 3D rectangular boxes. After this gig is finished, I plan to become a contributor to TinyTLF and hope to create some cool examples for public consumption as well as advance the use of splines in TinyTLF layout. Short and to the point. Paul Taylor just posted some demos, one of which shows the quadratic Bezier spline used in advanced layout and another showing the organic, spline-based scroller in action. I’ve pretty much decided to write a white paper on the math behind the scroller at some point in the near future. Paul Taylor and I are working on another demo. This one will be even more intense than the organic text we showed at 360|Flex . If you’re interested in finding out more about TinyTLF and want to see what you can do with all that stuff you saw in math class, then look for either the guy in the chair (twitter @guyinthechair) or the guy in tennis gear. See you at MAX!